Research on mass shootings shows guns do not make U.S. safe. Six things every American should know about gun violence. 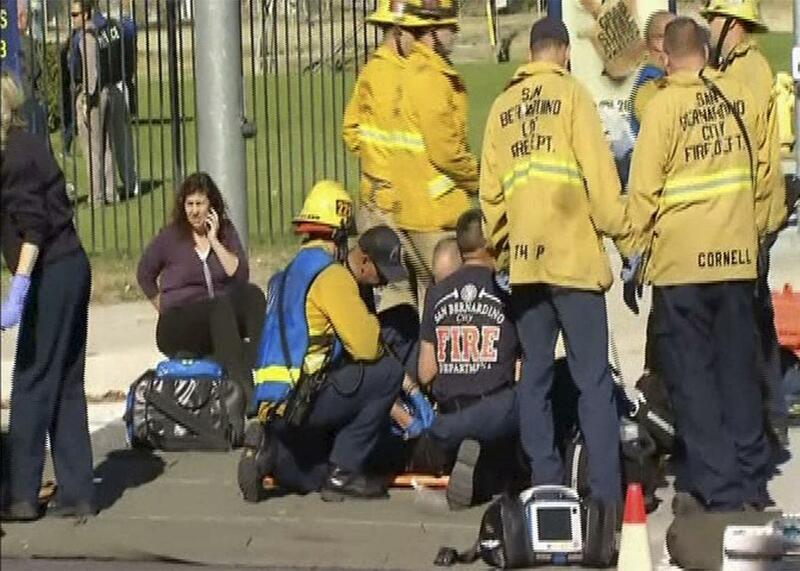 Rescue crews tend to the injured in the intersection outside the Inland Regional Center in San Bernardino, California, following a mass shooting, in this still image taken from video Dec. 2, 2015. As a criminologist, I have reviewed recent research in hopes of debunking some of the common misconceptions I hear creeping into discussions that spring up whenever a mass shooting occurs. This is what we know. The highest number of mass shootings experienced outside the United States was in Germany—where seven shootings occurred. A recent study published by the Harvard Injury Control Research Center shows that the frequency of mass shootings is increasing over time. The researchers measured the increase by calculating the time between the occurrences of mass shootings. According to the research, the days separating mass shooting occurrences went from on average 200 days during the period of 1983 to 2011 to 64 days since 2011. What is most alarming with mass shootings is the fact that this increasing trend is moving in the opposite direction of overall intentional homicide rates in the U.S., which decreased by almost 50 percent since 1993, and in Europe, where intentional homicides decreased by 40 percent between 2003 and 2013. There is no doubt that mass shootings are “terrifying” and “terrorize” the community where they have happened. However, few active shooters involved in mass shooting have a political message or cause. The church shooting in Charleston, South Carolina, was a hate crime. The majority of active shooters are linked to mental health issues, bullying, and disgruntled employees. Active shooters do not share any political motivations and do not aim at weakening government legitimacy. Instead, they are inspired by revenge or a quest for power. This change in definition directly impacted the number of cases included in studies and affected the comparability of studies conducted before and after 2013. Even more troubling, some researchers on mass shooting, such as Northeastern University criminologist James Alan Fox, have incorporated in their studies several types of multiple homicides that cannot be defined as mass shooting: for instance, familicide (a form of domestic violence) and gang murders. Gang murders are usually crime for profit, or a punishment for rival gangs or a member of the gang who is an informer. Such homicides don’t belong in the analysis of mass shootings. In most restrictive background checks performed in developed countries, citizens are required to train for gun handling, obtain a license for hunting, or provide proof of membership to a shooting range. Individuals must prove that they do not belong to any “prohibited group,” such as the mentally ill, criminals, children, or those at high risk of committing violent crime, such as individuals with a police record of threatening the life of another.